As slot game developers go, we know Yggdrasil are one of the most innovative out there. Their collection of unique titles emphasise playability and fun over franchises or movie tie-ins. The Legend of the White Snake Lady fits this bill perfectly and makes for a great escape into fantasy realms. Featuring over 243 different ways to win, re-spins, locked wilds and a top payout of a cool 1000x your stake, once you fire up the reels and get spinning. you'll soon recognise a game of true quality. 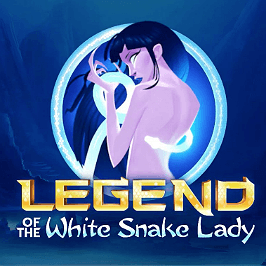 Play Legend of the White Snake Lady Slot Demo for Free! 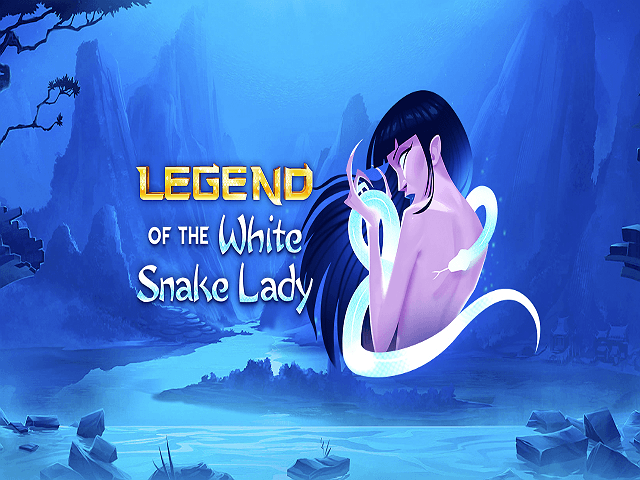 Play Legend of the White Snake Lady for Real Money! 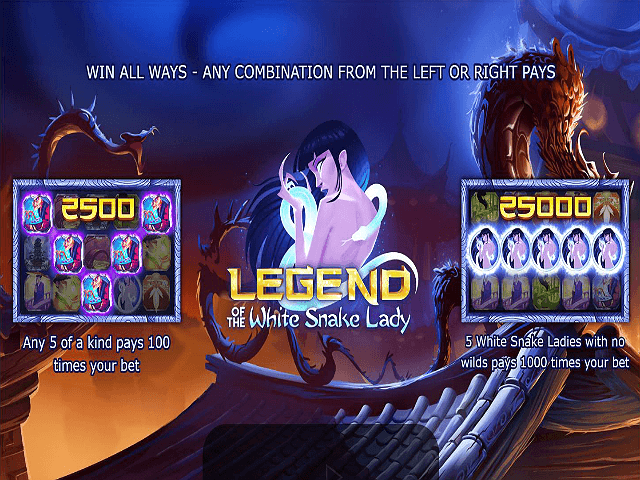 The Legend of the White Snake Lady online slot is exactly that: an ancient myth from Chinese folklore. It's had more than it's fair share of interest, too, having been translated into a movie, TV series and even a prize-winning opera. Now Yggdrasil have created a slot game based on the tale, innovatively recreating the mysticism and intrigue of the original material. The 5x3 reel set is animated, which means that each of the symbols has its own unique characteristics. Hair flowing in a breeze, water trickling, clouds moving – this is simply one of the most dynamic gameboards around. The symbols of the game are the individuals who make up the original Madame of the White Snake story. Expect to meet Fahai the Buddhist monk and Xiaoqing the green serpent, joined by bridges, temples and other Chinese artefacts. What is unique about Legend of the White Snake Lady is that it features Win All Ways technology. 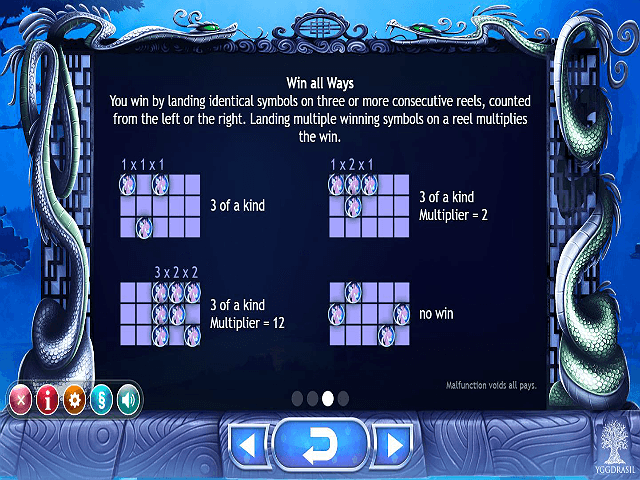 This basically means that any winning combinations of three or more symbols appearing on adjacent reels will trigger a payout: whether from the left-most or right-most reel. At the heart of all good things in Legend of the White Snake Lady game is the wild symbol, which appears on the middle reel only and in the middle position. Should you be fortunate to land this, strap yourself in for a magical ride... First of all, the wild locks in place for a re-spin. This is great news, as it also substitutes for all other game symbol in both directions. But that’s not all. Extra wilds are added to the third reel for re-spins, so it's actually possible to fill the entire reel with this high-paying symbol. The best payout in this game is available courtesy of the White Snake Lady herself. Land five of her symbol on your reels and you will trouser the jackpot prize of 25,000 coins. If you reveal four of the White Snake Lady and the fifth match comes courtesy of a wild, then a still-handy bounty of 2,500 coins is yours for the taking. And that’s the theme of Legend of the White Snake Lady: generous main game wins. Without a bonus feature or progressive, Yggdrasil have had to up the ante in the base game and that’s why handsome payouts – including 2,500 coins for five of a kind – are available. Share this Legend of the White Snake Lady Review today! 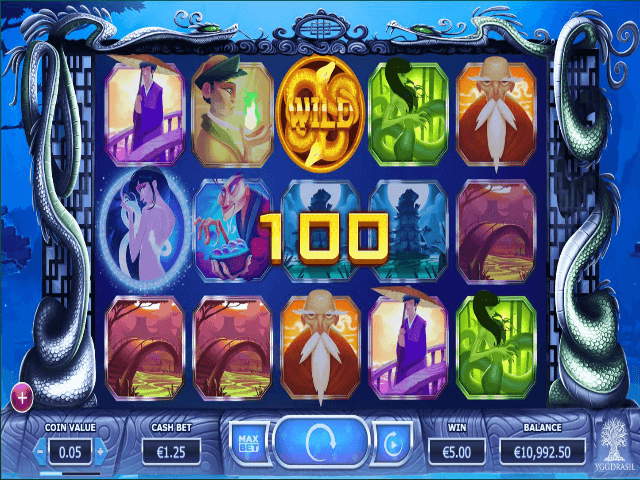 If you like Legend of the White Snake Lady, you'll love these slot titles too!